And the moment of truth...two roads diverged on the marathon course. Did Endorphin Dude take the left or the right? Drum roll please...the answer is...drum roll please...13.1. 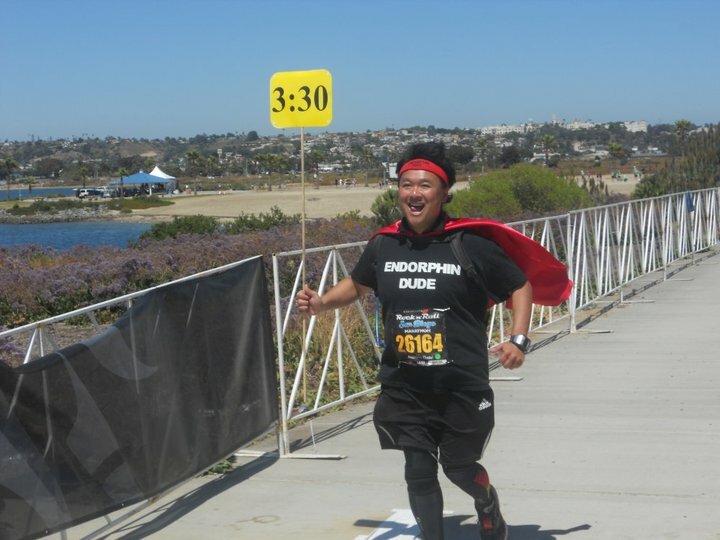 This marathon caped crusader gave his best, but after being hit with kidney stones the day before, he just couldn't muster up the energy to complete the full marathon. E-Dude veered off and completed the half. I don't like downgrading. 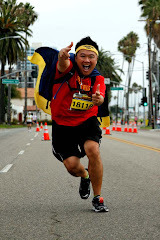 If I'm registered for a full marathon, I want to run that full marathon! However, it just wasn't in the cards for me this time around. I showed up on race day with every intent of running 26.2 miles, but by mile three, I came to the realization that that was a fantasy. Exhaustion kicked in quickly and my lungs felt deflated. All this because of a kidney stone bulldozing its way through my insides. It all started right before I boarded my flight to Seattle. I saw the first two signs of kidney stones and I immediately knew that my weekend was doomed. On the plane, I drank as much water as I possibly could in order to flush that little sucker out. I began to feel sharp pains and when the plane landed, nausea kicked in. I'm not going to get into the gory details, but let's just say that for the next 12 hours, my sister, nephew, and niece had to endure the unpleasant sight and sounds of a very sick Endorphin Dude in pain! Thankfully, I packed some prescription pain killers which alleviated some of the pain. All night long, I drank gallons and gallons of water hoping to pass that stone. No luck. Fortunately, by mid morning, the stone must have moved to a different part of my body because I didn't feel that sharp pain anymore. However, by then, all my energy was completely zapped, and making it to the expo proved to be a huge challenge. Nonetheless, I put on my game face and showed no sign of agony! Seeing all my running friends at the expo and then later at the carbo load dinner definitely helped get me into the spirit of the marathon. 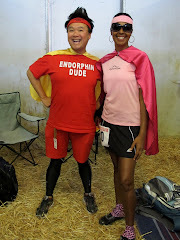 It's Endorphin Dude and Scott Jurek! Finally, I get to meet the running Calley family! Who the heck is this guy anyway? I see him everywhere. 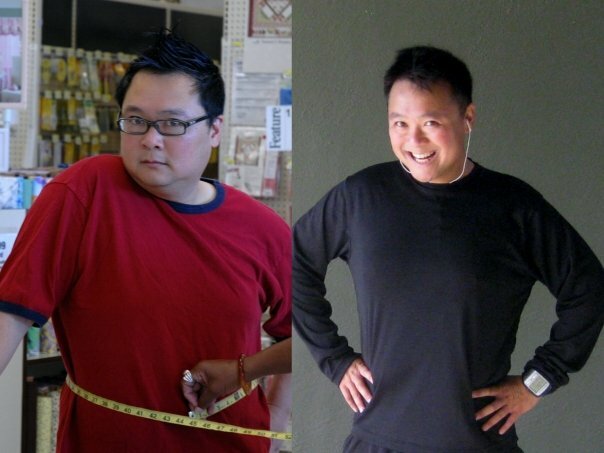 Endorphin Dude and the funniest chick in Seattle. 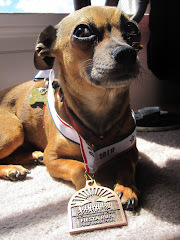 Aside from the disappointment of me not being able to count this marathon toward my Titanium quest, I was really bummed that I couldn't give 100% at the race where my nephew Michael and niece Teresa were makng their half marathon debuts. It would have been nice to have been able to cross the finish line at roughly the same time, but I struggled and ultimately completed the 13.1 miles in about 4 hours and 15 minutes. 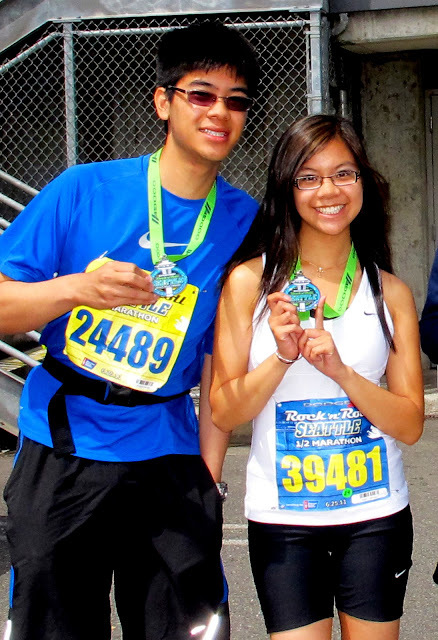 I just couldn't bear the thought of the DNF in Seattle, especially with my family there. I'm bummed that I wasn't able to get the 26.2 miles in, but at least I did finish the half marathon and still stayed on track for the Rock Idol medal. The road to that finish line was tough, but what got me there was my drive and the many familiar faces out there who knew I was in pain and cheered me on. There's my awesome niece Teresa. She passed up Uncle Endorphin Dude at mile 6! Gotta get that group shot in. This guy saved me. Dr. Soriano was my psychiatrist at my mile 11 his mile 14. A colossal melt down nearly derailed me but he got me back on track. Thanks Louie! Gotta get the shot with the cheerleaders! And toenails are for sissies, too! Finish line group shot with some Marathon Maniacs. Only two of them are in Maniac gear! Malain and Natalie of The Competitor Group at the finish line. I love these girls. You gotta love this shot. I do. 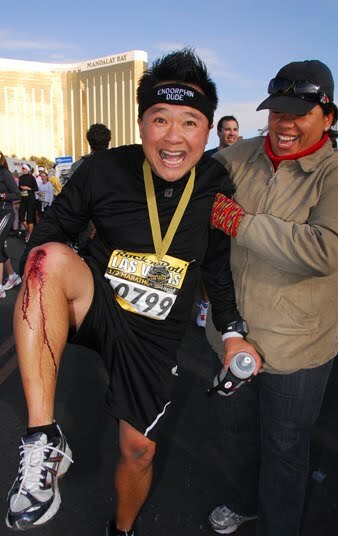 And here I am with Steven Yee, Mr. Marathon Maniac President! I am proud to say that I completed my 39th life time half marathon. Do you know what makes me even prouder? Michael and Teresa. These two are running superstars. Teresa finished in a little over two and half hours and speedy Michael got the job done in 2:09! Now here's the kicker: later that night Michael said to me, "I want to become a Half Fanatic." SCORE!!!! I pulled up the Half Fanatics race calendar and together we found races that would qualify him. Teresa then said, "Hey, I want to become a Half Fanatic too!" First my sister Diane, and now the my nephew and niece. Woo Hoo! WHOA! 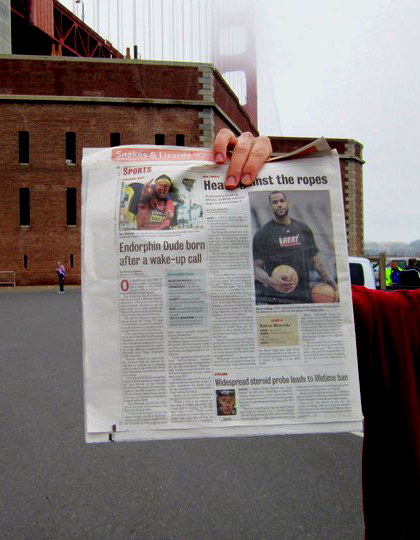 Endorphin Dude made it into the sports section of the San Francisco Examiner, and right next to LeBron James! A few weeks back, your marathon caped crusader was interviewed by David Liepman of The Examiner, but I wasn't really expecting this to go to print until the San Francisco Marathon at the end of July. Therefore, this was a very exciting surprise to see this! "Endorphin Dude born after a wake-up call." I love it. On another note, I gotta say that I love my running club. I know I've said this before and I will continue to say it again and again. Dolphin South End breathed new life into me. Without DSE, I'd be sleeping in every Sunday unitl the late afternoon, vegetate the rest of the day away, and watch my health decline. If I am injured or just simply can't run, you can be sure that I'll be out there supporting my fellow DSE runners. I can proudly say that this club changed my life for the better, and I am very happy to be a part of this family. 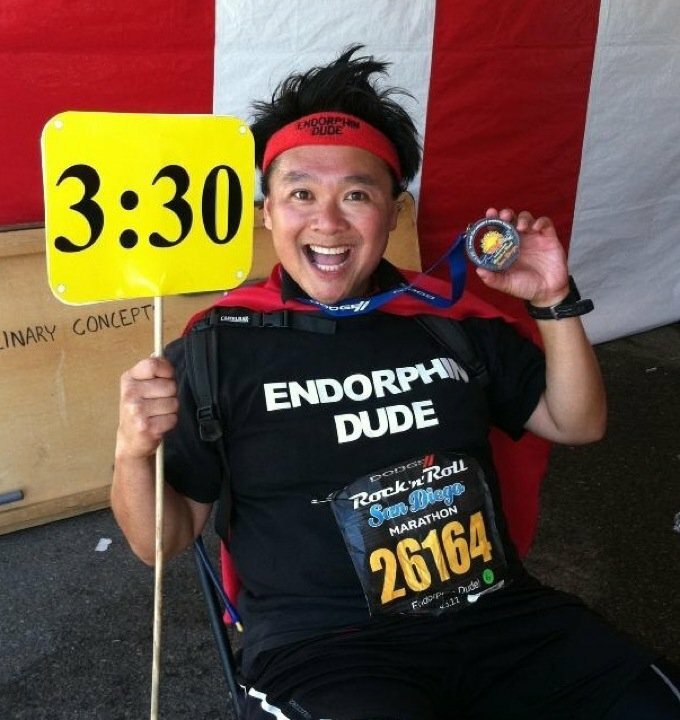 Endorphin Dude has a theme song! How random is this? There I was at mile 17 and there sat on a lawn chair this spunky ukelele strumming crooner. He would come up with a very quick and creative impromptu anthem for every runner who ran by! Of course, I had to stop to get a video clip of him. This guy is truly amazing. He came up with this song on the spot! The other amazing thing about this theme song is that it almost didn't happen. 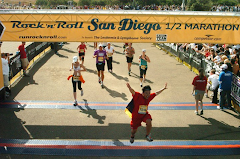 I'm not going to sugar coat this and I'm just going to be straight up blunt: I struggled in San Diego and I almost detoured off the full course and joined the halfers. My sciatic nerve flared up at about mile 14, and I pretty much walked the second half with a bag of ice tucked in my compression pants. Fatigue and exhaustion also played a huge role in my down fall in San Diego as well. 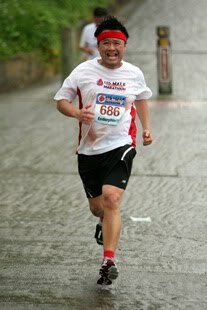 I have run many races over the past few years, so I have a lot of experience and pretty much know what to do to survive. However, something happened to me in San Diego that has never ever happened on the course before: I fell asleep. It's true! Half way through the marathon, I felt so tired that I pulled over to a bench to stretch out my leg, and the next thing I knew, I fell asleep for six minutes, according to my Garmin! I had never fallen asleep on the course ever before. Fortunately, there was a liquor store near by, so I was able to quickly jump in and get a double expresso cappuccino canned drink. The caffeine gave me that zing, but that pain in my back and leg kept me from running, and at the end of the day, it took me over eight and a half hours to cross that finish line. BQ Baby!!! I led my 3:30 pace group to a 2:43 finish!!! Oh wait, does 3:30 mean I have to finish 26.2 miles in 3 hours and 30 minutes and not at 3:30pm? I finished at 2:43pm. The race started at 6:15am. Oh snap! What kept me off that sag wagon was the fact that there were at least 100 people still behind me. Team In Training also saved me, as I knew that the finish line would not close until the final TNT participant crossed. 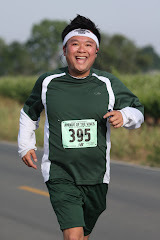 There were a lot of people struggling behind me, so I knew I could drop my pace and still finish. 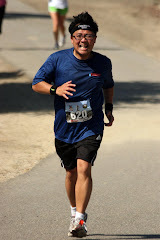 At about mile 22, I saw a 3:30 pace sign on the ground, and I had to pick it up. It was one of the only things out there that kept me sane. I felt like Tom Hanks in the film "The Castaway," because by mile 23, I was on this dreadful place called Fiesta Island and I had my version of his soccer ball "Wilson." That sign kept me sane on that island because it garnered me a lot of laughs and looks of confusion. 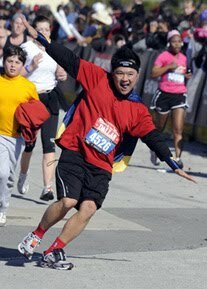 The only other thing that kept me going was seeing all my Marathon Maniac friends along the course. Sadly, though, when I got to the later miles, everyone had already finished, so I didn't get to see any people on Fiesta Island, which by now you've probably figured that it wasn't very festive! There's Tyler Rich, the Teddy Bear Factory Doctor! Me and Eli! I hadn't seen this guy since Rock 'N' Roll Arizona. I always get a shot of energy when I see MG. What class act. This guy may look like a jester, but he's my hero. Thank you Elizabeth Mckay and Mohan Dutt for waiting for me and running me in. It's so nice to see a familiar friendly face at the finish line. At the end of the day, I got the job done. This was an extremely difficult race for me. It's amazing how defeated you can feel, but if you just keep telling yourself to never give it, the power of positive thinking will prevail. I had to play mind games to get to that finish line, and I am extremely happy to have this hard earned medal hanging around my neck. My life time marathon total is now up to 25. Wow. Titanium Score Board: 18 down, 34 to go!